Nighttime Satellite Images Shed Light On China's Building Spree In Developing Nations : Goats and Soda There are a lot of state secrets when it comes to the billions of dollars worth of roads, hospitals and more. Satellite images of night lights may offer some insights into their value. The circles on the map pinpoint the location of thousands of Chinese-funded development projects. The bigger the circle, the bigger the investment. The largest circles represent projects in the multibillion-dollar range. Now the AidData team at the College of William & Mary is using night lights to shed some light on that last question. In recent years, China has been very clear about its ambitions to expand trade and influence via infrastructure and investments in other countries. They call it the "Belt and Road Initiative." But nearly everything else about China's development strategy — its spending, projects and project locations — is officially a state secret. That shroud of secrecy has bolstered a popular narrative that China is a "rogue donor" that pours money into undemocratic governments to promote Chinese growth and access to natural resources. Skeptics say the Chinese projects are of little use to the countries, often in Africa, where they're built. Politicians have described some of them as "white elephant" projects. They point to seaports, bridges and other projects that cost a great deal to build but aren't actually getting a lot of use. It also doesn't help that there have been numerous accounts of shoddy construction: A road in Zambia washed away during the 2009 rainy season. A bridge in Kenya collapsed during construction in 2017. And a hospital in Angola was evacuated months after opening in 2010 for fear it would collapse. Development specialists say these accounts are concerning, yet some leaders of recipient countries still voice their preference for working with China. Their argument is that China is a "one-stop shop," not only financing projects but building them as well. Often, it's cheaper and faster to work with China than with traditional donors, like the World Bank, and it comes with fewer strings attached, such as requirements to privatize the project once it's built. And now there's another point in China's favor. New research suggests that China's infrastructure projects may be better at reducing inequality in developing countries than many Western programs. "It could be anecdotally true that a given project was a white elephant, but it isn't systematically true," says Bradley Parks, one of the study's authors and executive director of AidData. Parks says that according to his team's research, there is a strong correlation between Chinese projects and economic growth in the countries where they're built. He also says that Chinese-financed "connective infrastructure" — things that connect people from one place to another, such as roads, bridges, railways and ports — are distributing economic growth into rural areas more evenly than traditional Western development programs have. That's because China favors projects that connect people and businesses from rural, remote interior areas to bigger coastal cities, where there are more economic opportunities. 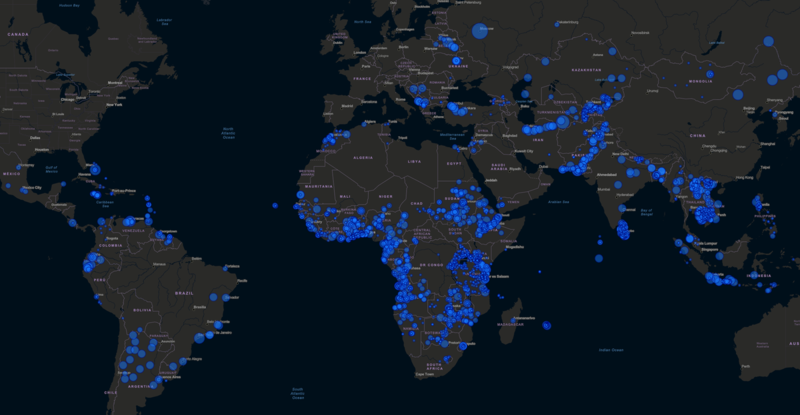 The AidData team came to that conclusion after identifying and locating more than 4,400 Chinese development projects implemented in 138 countries between 2000 and 2014. They did so using online sources, like news articles, Chinese embassy websites and field research from academics and nongovernmental organizations. "The Chinese government doesn't have a central data set that they share," Parks says. "But there's a huge amount of information that is scattered across the Web." Then they looked at nighttime satellite images from the U.S. Defense Meteorological Satellite Program's Operational Linescan System satellites. Parks says that it's "reasonably well-established in [academic] literature" that nighttime light is a good indicator of household income – more light means that families in that area have more money. The AidData researchers measured changes over time, starting back in 2000 and going up to 2013, in the amount of light visible within a certain distance from China's connective infrastructure. They found that in the later images, light was not just concentrated in the immediate vicinity of the projects, but it also had spread within the provinces and districts where they were built, as well as between provinces and districts. This, they say, suggests that Chinese connective infrastructure is spreading economic growth across large regions. Some researchers, though, say there's more digging to be done. "There is no doubt that many Chinese investments have had a positive impact, regardless of how short-lived," says Jacqueline Muna Musiitwa, an international lawyer based in East Africa. "That said, it is important to determine [definitively] if incomes are increasing, what money is being spent on and whether quality of life is improving. It is not enough to look at economic growth figures, because they do not adequately tell the story at the micro-level or change our daily engagement with poverty." Johannes Urpelainen, director and professor of energy, resources and environment at Johns Hopkins School of Advanced International Studies says he thinks the study is "a good step forward" and consistent with what other research has shown about the potential of infrastructure to reduce inequality. "The next step would be to collect more detail on what's actually happening in these communities," Urpelainen says — for example, if any factors, other than household income, are contributing to more light. "It's a very big challenge, but that seems to be the most important next step." Parks agrees that their measures of light "could also capture other aspects of human development, including local health and education outcomes." But, he says, even if it does include other factors, finding a relationship between connective infrastructure and those results – including reduced inequality – is "still good news."